If someone in your chorus uses a riser chair (or other riser "accessibility" equipment), here is some information they'll need to know. • ​ We will be using StageRight risers for contest (see photo). All of our research and inquiries lead us to believe that Peery riser chairs, as well as other "riser aids," should fit, as long as you allow for the singer's individual placement (for example, riser chairs don't work well for R5 singers or for those who stand "on the crack"). • ​ We HIGHLY suggest you test out your chair/aid BEFORE you plan to use them! If you have specific questions or wish to test something, please email Judy Galloway at jhgalloway47@gmail.com. She will set up a specific time to meet and see if your equipment fits (available times include Thursday between 10:00am - 3:00pm or after 8:00pm, or Friday morning between 8:00-10:00am). NO DROP INS! Please set up a time with Judy! • ​ Riser chairs/other equipment can be brought over to the First Interstate Center for the Arts (formerly known as the INB Center) on Friday for quartets and on Saturday morning for choruses. They will be stored backstage in a designated area. ​ • ​ Someone from your chorus needs to be responsible for putting on and removing the riser chair/aid. Staff at the First Interstate Center for the Arts (FICA) cannot contractually help. You are responsible for installing the equipment on the risers before you sing, and for removing it after your contest set is over. • ​ ​ ALL riser chairs and/or other items must be removed from the building immediately following the chorus contest announcements. 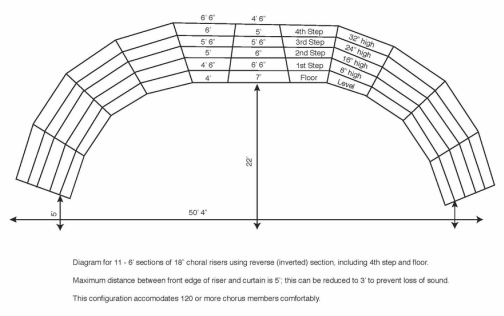 For 2019, Region 13’s chorus competition will start with the “Alternate Configuration.” Then, during a break, the risers will be expanded to the “Standard Configuration.” This year with our contest being in FICA, there will be a curtain, so choruses and quartets should plan accordingly. TO AVOID CONFUSION, PLEASE READ: Sweet Adelines International describes the Alternate Configuration as accommodating up to 70 chorus members comfortably, while the Standard Configuration will accommodate up to 120 singers. 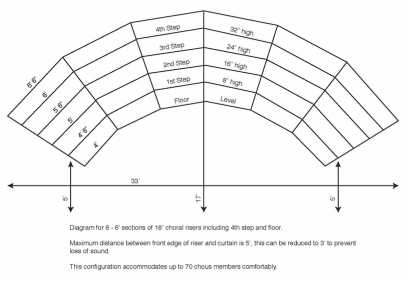 In other words, the Standard Configuration is for larger groups or choruses needing to spread out, and has an inverted center section and more "flat" risers. The Alternate Configuration is generally preferred by smaller choruses, as it offers more curve and there will be less empty space at each end of the risers. It is vital that when choruses register with International they select the correct riser configuration for use at regional contest. Changing your configuration after the order of appearances have been drawn will result in a late fee. Please, look at the comparison below, or click these links to see larger plans: Alternate configuration / Standard configuration. Competing in the Open Division? • ​ We will have curtains. • ​ The risers do have back rails. • ​ The Alternate Configuration will have six sections of 18" choral risers; Standard Configuration will have 11 sections. ​ • ​ Technical details about the FICA stage can be found by clicking here.